People have been spontaneously posting Shirley Hughes images on Twitter this morning in reaction to last night’s attack on so many children and parents in Manchester. Author Anne Booth captured my own feelings perfectly. @tygertale @ShirleyHughes_ I just felt I wanted to share work which celebrates tenderness & love & care for the little & most important things & people. I love her. I wanted to add to this with an appreciation of the first book of Shirley’s that I remember, possibly the very first book I ever read, Lucy and Tom’s Day. I’d dug it out on the weekend for a course I attended run by the Golden Egg Academy. They’d asked us to bring something special from our childhood to discuss, and nothing sums up my own memories of growing up in suburban England in the 1970s better than the work of Shirley Hughes. 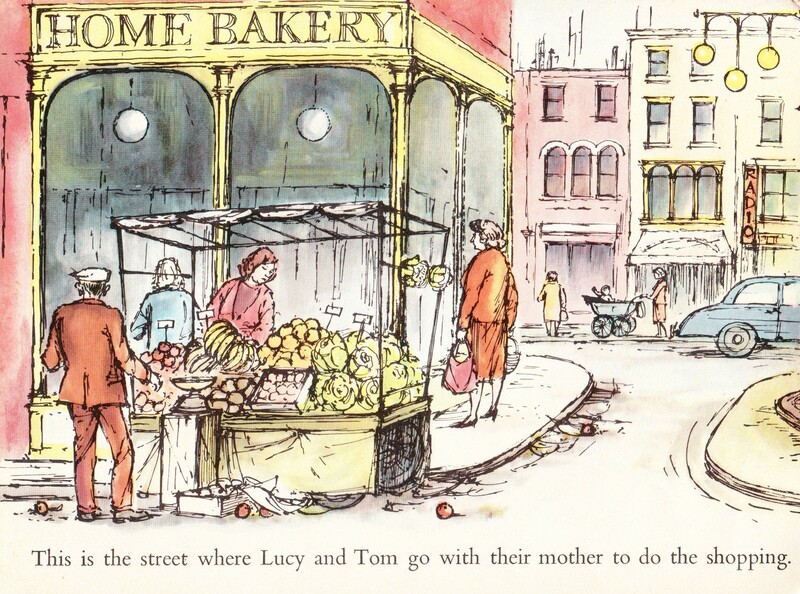 Everything about the world of Lucy and Tom still feels true to my own memories of childhood, to the extent that I wonder if my mum based our lives around these books. We’d shell peas, bake little pastry ball cakes and make dens from quilted duvets hanging from the back of an old iron bedstead. I even have that wheely dog and jangly telephone toy somewhere in the loft still. 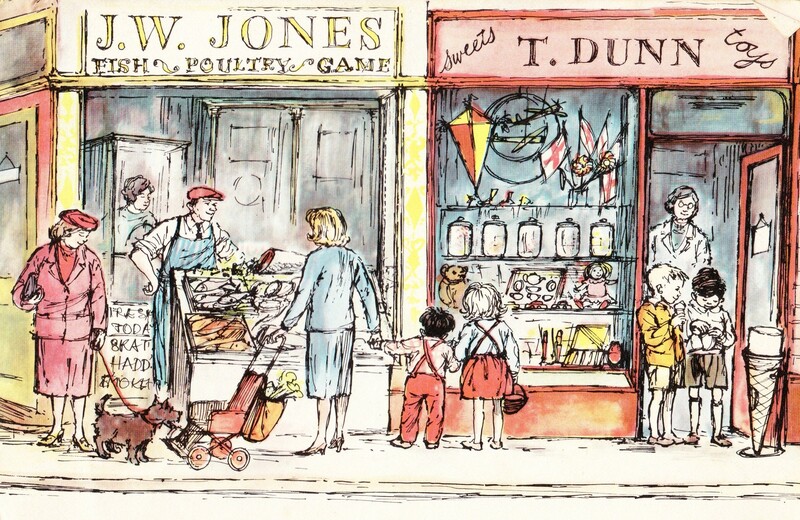 Shirley Hughes’ genius is in observation. Her ability to capture something of the true essence of childhood. And she had this skill from the very beginning. Today most colour lithograph printing is done in Europe or the far east. Lucy and Tom however travelled no further that Acton. Together with editor Livia Gollancz, Shirley arrived at Lowe and Brydon’s print works where they were met by a ‘very brisk man (Mr Lowe, perhaps, or was it Mr Brydon?) in a coat brown overall with a pencil tucked behind his ear.’ It’s not hard to picture a Shirley Hughes pen drawing of this encounter. It was a modest beginning to a stellar career in picture books. Lucy and Tom’s Day has been out of print for some time, possibly because of the problems with the colour, or maybe because it is such a period piece. Not that I noticed any of this reading the book in the 1970s. Even today the slightly rudimentary colouring just adds to the atmosphere. I will forever cherish this book – even though it’s suffered some serious damage over the years, most recently in the jaws of my own children’s pet rabbit Sparkle. The Britain inhabited by Lucy and Tom has changed beyond recognition in the six decades since it was published, but her observations of family life are as true as they ever were. I’ll finish with another tweet, this one by the author Dawn Finch in reference to a later Hughes illustration from the Big Concrete Lorry. Quotes taken from A Life Drawing: Recollections of an Illustrator by Shirley Hughes, published by Penguin books. Tags: Edward Ardizzone, Gollancz, Lithography, Lucy and Tom's Day, Shirley Hughes. Bookmark the permalink. I loved this – and obviously, as I was quoted, I agree with the admiration for Shirley Hughes! I also learnt a lot. Thanks Anne, Shirley’s the greatest! This is such a lovely, thoughtful appreciation Jake, thank you – Mum will be very touched to read it. For me I am filled with almost overwhelming nostalgia and warmth, maybe for my own childhood or for bedtimes sharing this book with my own two when they were small… or maybe because an early copy (possibly a first edition) was cut up and collaged onto the walls of her downstairs toilet where it remains to this day! Clara, I think that might be my favourite ever comment on this blog. Proud to share the contents of Shirley’s downstairs toilet with the world!